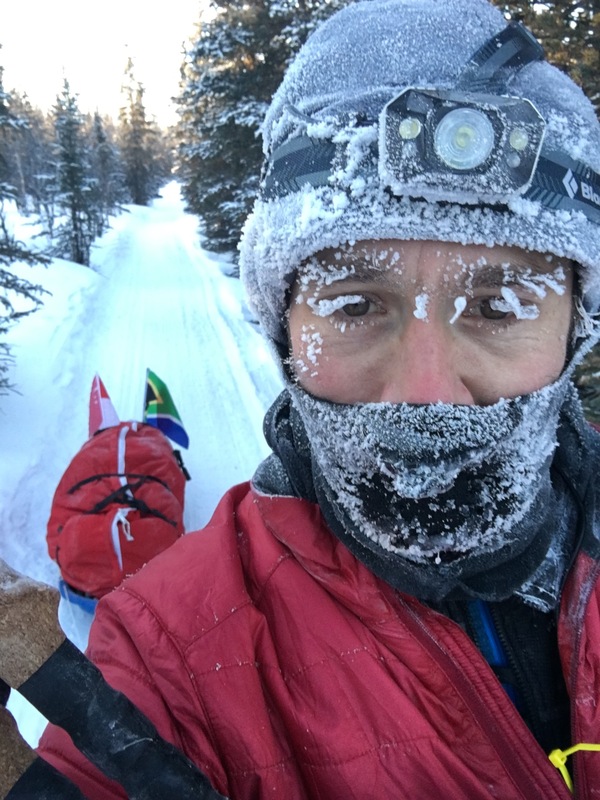 The Yukon Arctic Ultra is labelled ‘the world’s coldest & toughest ultra.’ Toughest, maybe. Coldest, definitely. 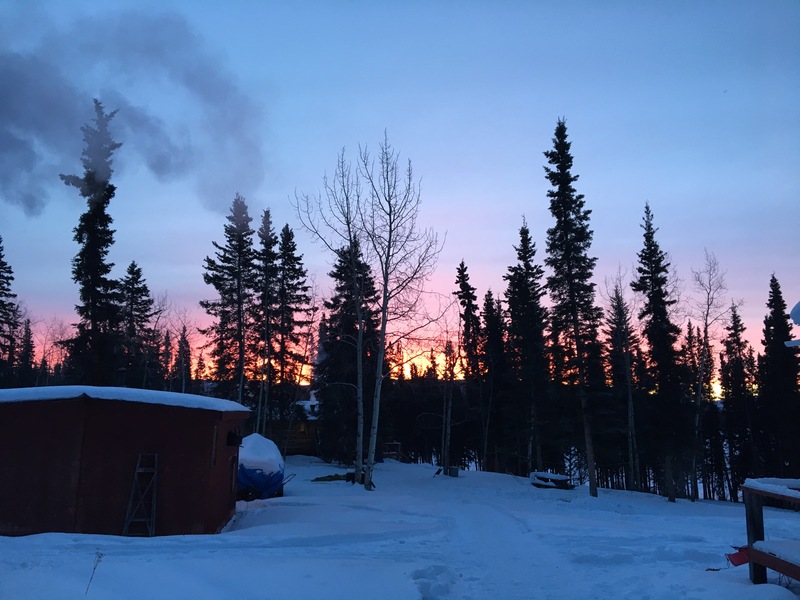 Daytime temperatures around -20 degrees are considered ‘positively warm’ while overnight the temperature drops into the -30’s and occasionally crosses -40. 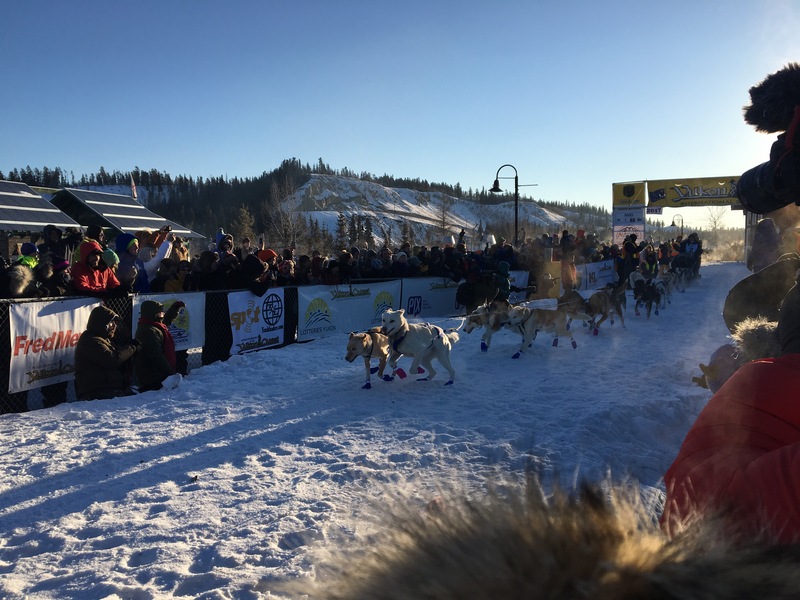 Yukon Arctic Ultra competitors start a day after the Yukon Quest dog teams & follow the same course northwards, choosing to go to either the marathon distance, 100 miles, 300 miles or 430 miles. 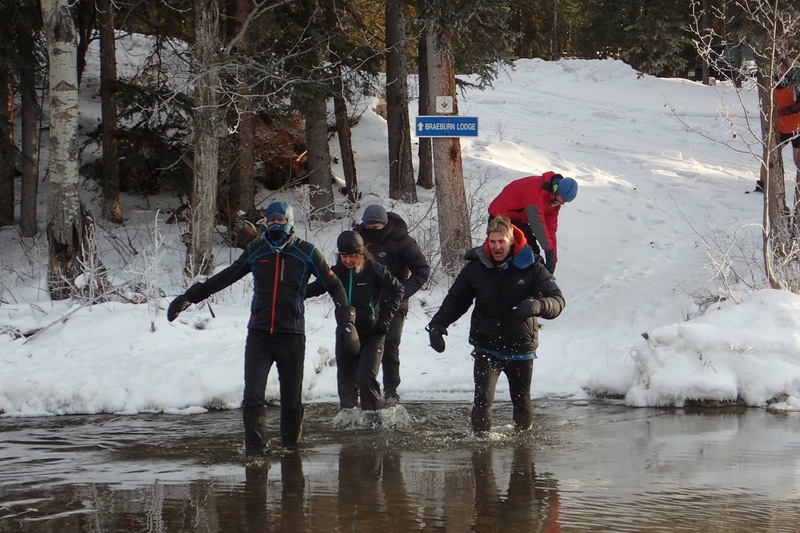 They also choose their mode of transport – fat bike, cross country skis or on foot. It’s a single-stage race. Everyone starts at the same time and the timer doesn’t stop until the finish line. Sleep, pace, time out to eat, drink & recover are all up to the competitors – there are no requirements of when or how long to stop. Everyone has a different sleep strategy, pacing & nutrition plan. Competitors haul all their food and gear on a pulk. 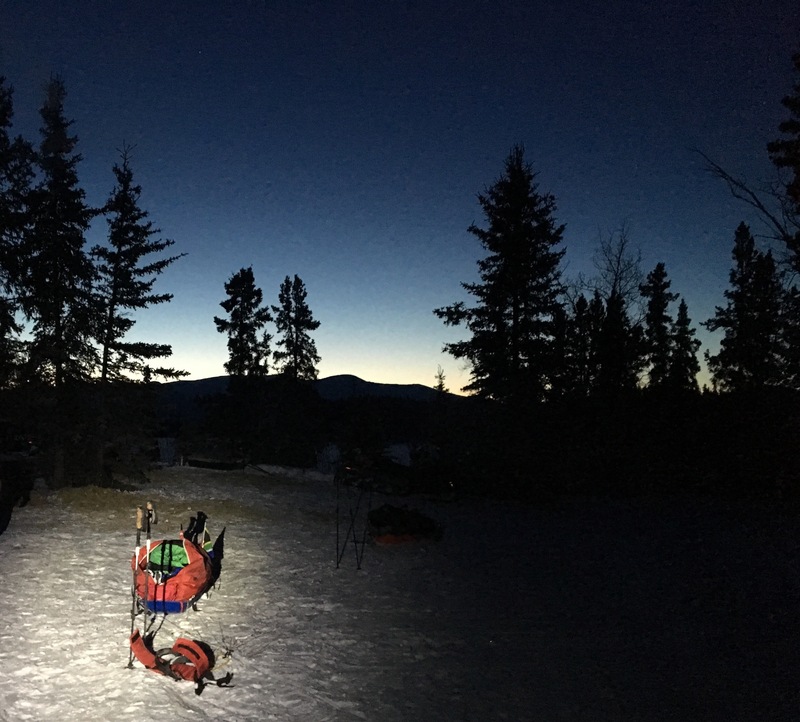 Stove, medical kit, sleeping bag, tent or bivy, additional layers of clothing, a few days food, thermos’ with hot water and satellite tracking units are carried on the pulk. 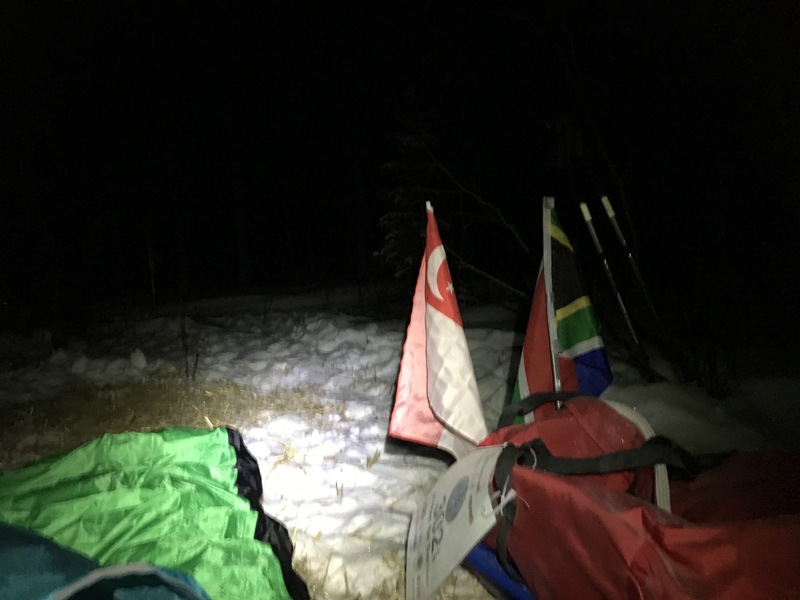 I left the start line at 10:30am on Sunday 5 February 2017. 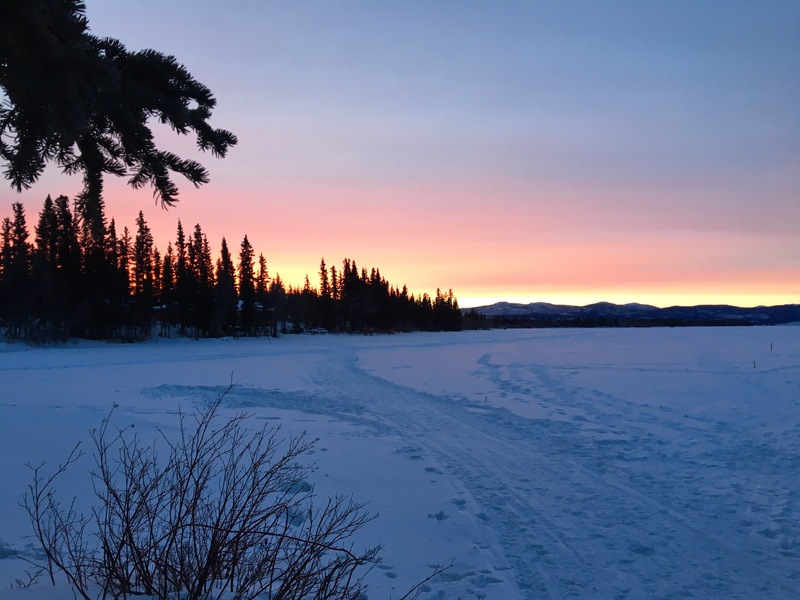 300 miles of frozen Yukon ahead, months of planning, researching & training behind. Getting to the start line is where most of the hard work and adventure lies, as is usually the case. Months of balancing work, life & sleep with an intense training program is probably the toughest part of the challenge. Then there’s countless emails, messages & coffee’s with others that have done the race before – or something similar – to navigate the way through what gear would be needed & try to get an appreciation of what your body may go through. I had an enormous amount of valuable feedback from others. However, even with all that, there’s no substitute for experience. There’s no way one can understand that cold environment from behind a cuppicino in Singapore; you need to be standing in it, breathing it, having it slice through you, before even an inkling of appreciation of what it is can take hold. 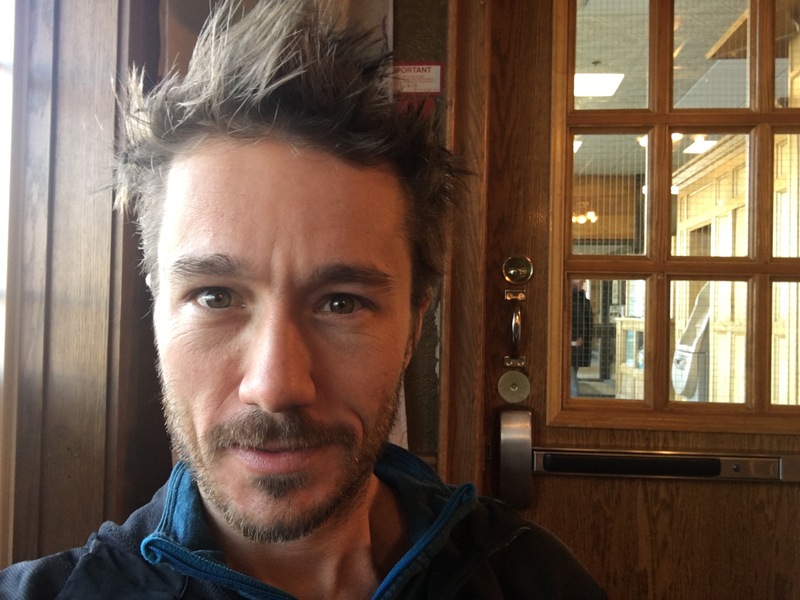 I planned to get to the Yukon a week before the race start and attend a Survival Training Course. That would give me time to acclimatize while getting hands-on experience of using my gear while being exposed to that incredibly harsh environment. Attending and getting to know the 12 others on the course turned out to be a highlight of the trip, possibly bigger than the race itself. 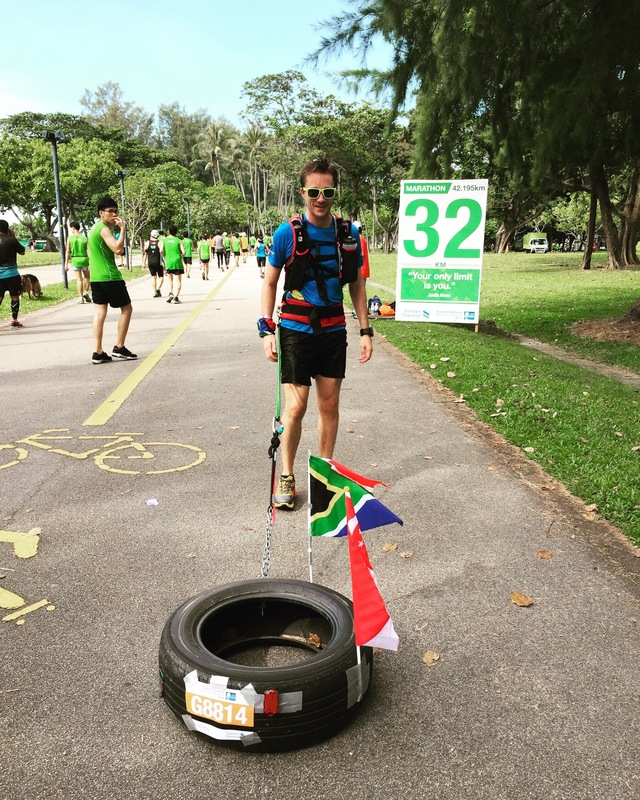 An opportunity to swap stories about other adventures; from swimming the English Channel to rowing the Atlantic to desert and jungle ultra’s – everyone had an impressive CV of past experiences! First, the river crossing. We needed to be prepared to deal with slipping into overflow (water flowing over the top of the ice along river beds.) The best way to prepare: do it, in a controlled environment. In small groups we walked across a knee deep stream. Not too bad while in the water (which is slightly above zero degrees). However, seconds after stepping out everything wet freezes & the temperature plunges to nearer -30. A very very fast clothes change is required, followed by (for me) an incredibly painful re-heating of my feet near a fire. Not cool. Second, my initial attempt sleeping outside in a bivy bag (that’s a waterproof shell for a sleeping bag, used instead of a tent.) Inside the down sleeping bag rated to -40 (temperature was -36 that night) was warm & toasty. However, getting from there to kitted-up & moving is not pleasant. 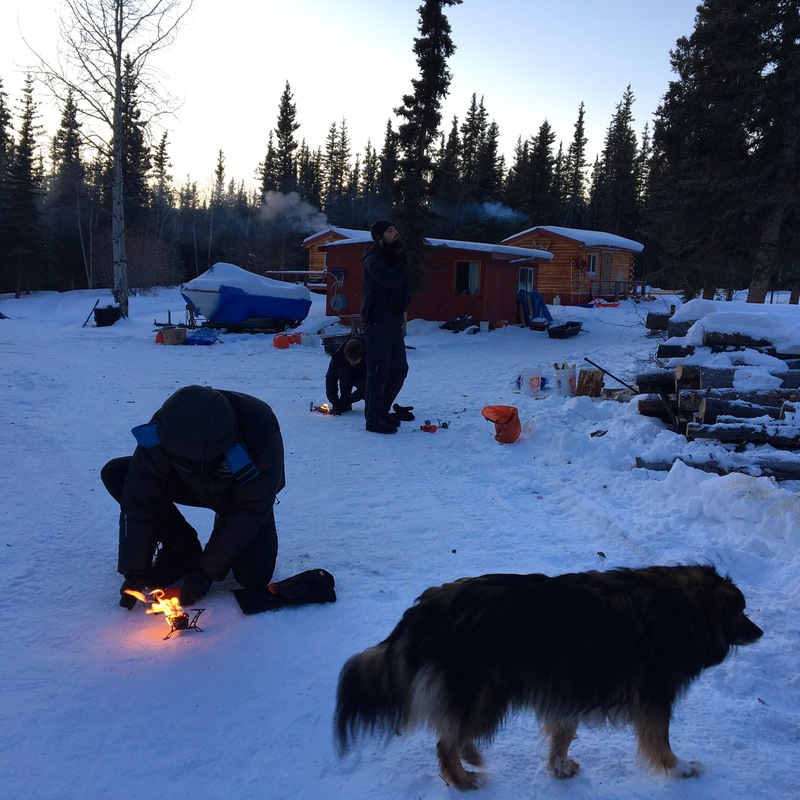 My hands froze up, making operating zips or drinking hot water (to warm up) near impossible. I struggled though it and eventually got it right but needed a better process for on the race – it had been very painful & cost way too much energy. 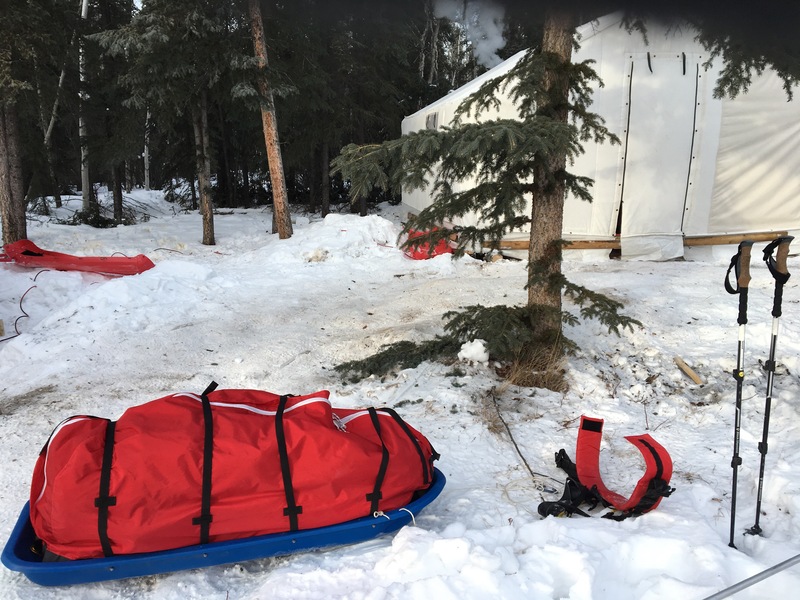 The Survival Course session on hypothermia put that cold environment into perspective. Our bodies are normally at 37 degrees. Drop more than 2 degrees to below 35 and you have moderate hypothermia; reduced conciousness, loss of use of hands and irrational behaviour. Around 32 degrees is severe hypothermia and very likely death. That’s only 2-5 degrees away from 37. Most nights the temperature is 70-80 degrees away from 37! 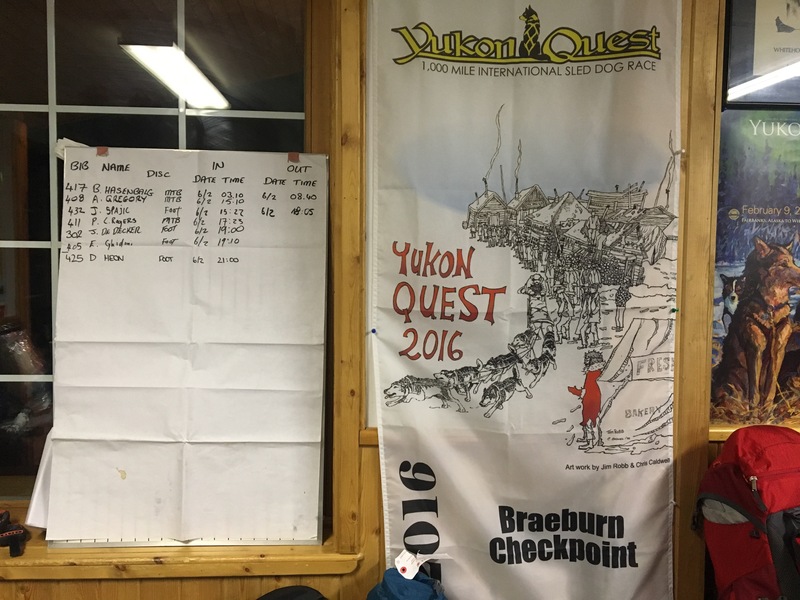 The Yukon Arctic Ultra is really well supported and it seemed most the town were out along the first few kilometres of the course. I started near the front a set a comfortable pace, getting to the marathon runners’ finish line just before dark. Then pushed on until 1:30am to get a total of 84km along the course before my first sleep break. My strategy was to sleep 3 hours every 24, which had worked well on many of my training weekends. I slept around 2am to 5am and quickly got moving again. 90 minutes later I got to Dog Grave Lake check point, where I could get hot water for my flasks. A quick refill and I was moving again just as the sky started lighting up. 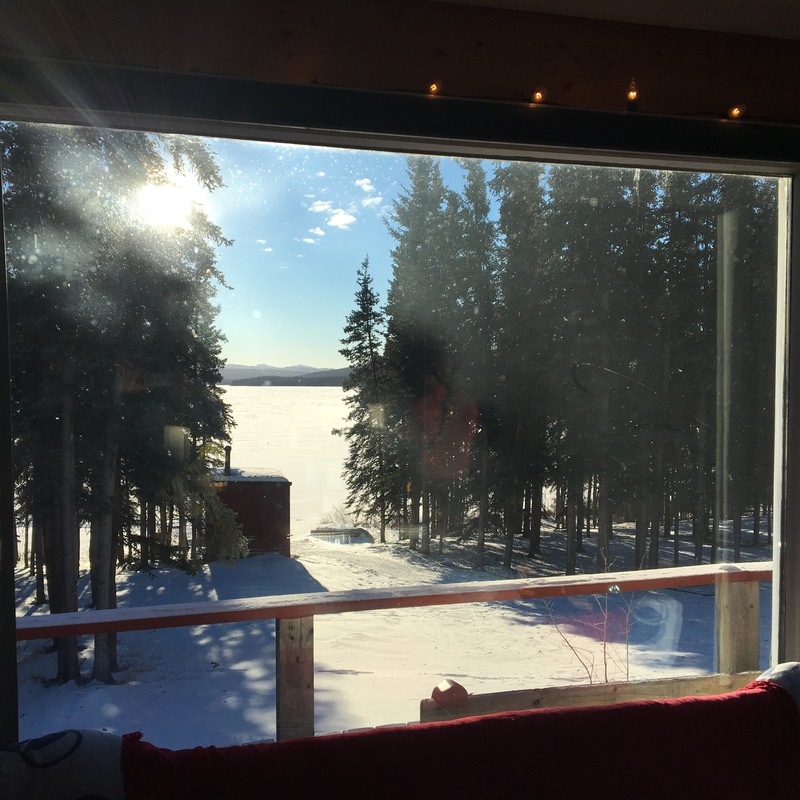 Warmer temperatures (from -38 that night to above -30) would come with the sunlight. That second day went really well. I caught up to Enrico – a 63 year old race legend that has 7 finishes and a coupe wins already. 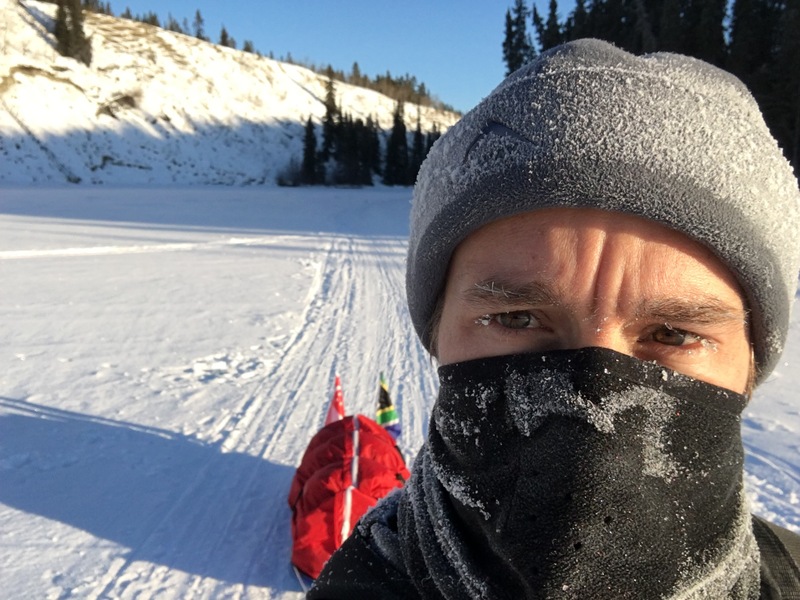 This year he’s doing the 430 mile race then going on alone all the way to Fairbanks to complete the 1,000 mile Yukon Quest course! He’s still out there and hopefully he makes it. Below zero degrees moisture is the enemy! The face mask gets moist from breathing, some of that gets to my eyelashes and eyebrows; all of it feeezes. I also need to be careful not to sweat too much, that freezes too. 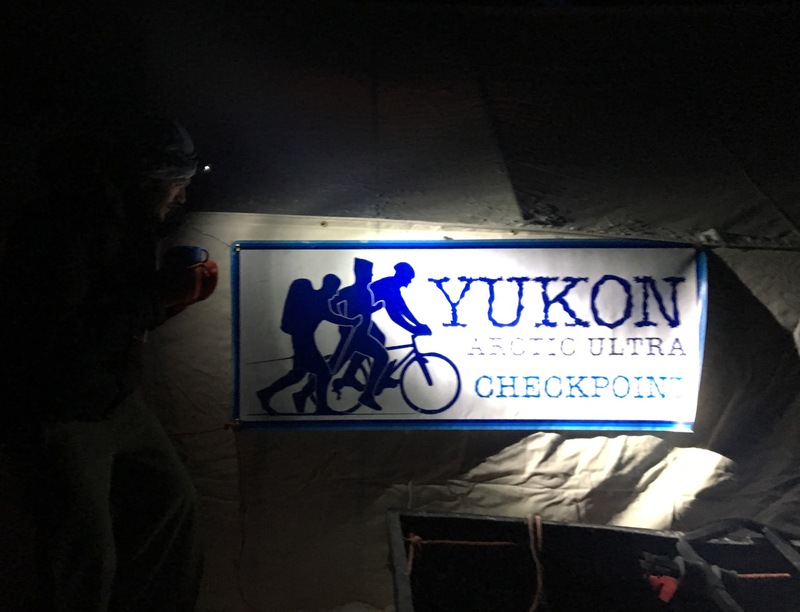 I reached the checkpoint at the 100 mile race finish at 7pm, just after dark and a little under 33 hours since the start. I was leading the 300 mile race by then and not far behind the 430 mile race leader. Feeling strong I aimed for a quick meal and then to push on another 4-5 hours that night before getting my planned 3 hours sleep. I didn’t know it yet, but that 100 mile finish line would become my finish line too. Once inside the warm checkpoint I got a meal and removed my shoes to dry them & my feet near the fire while I ate. 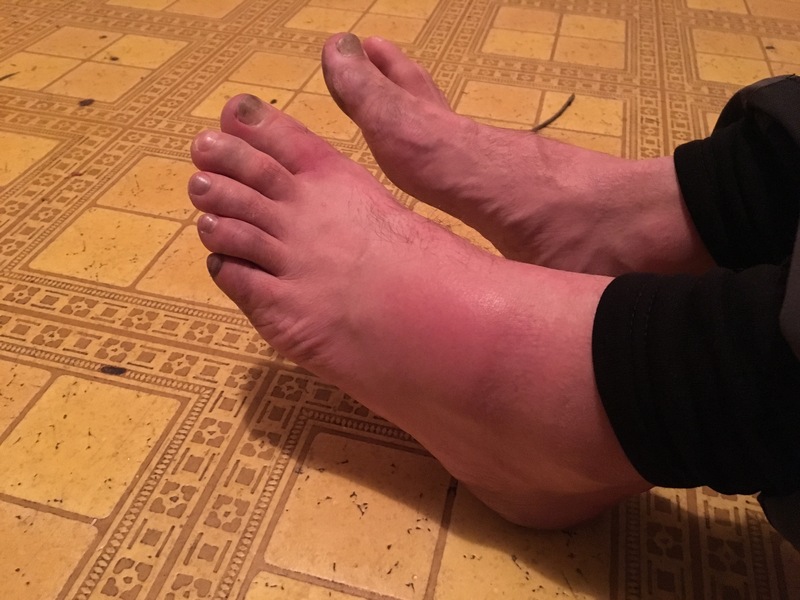 With the pressure of the shoes released my left foot quickly swelled up. I hardly noticed until I tried standing on it and the sharp pain quickly forced me back into my seat. The medic suggested I spend the night at the check point with my foot elevated and reassess in the morning. It would be too dangerous going out into the colder night temperatures anyway – I would be moving slower and therefore easier get get cold, making me more susceptible to frostbite. Waking up early the next morning I slowly lowered my foot to the floor and applied weight. Sharp pain. Not good. I gave it a few more hours of elevating and icing, hoping that with time there would be signs of recovery. Still no improvement. Continuing with the race (another 200 miles) would very likely cause longer term damage to my foot and the chances of other issues like frostbite increase exponentially. 15 hours after arriving at the check point I decided not to continue. It wasn’t a hard decision at all. I knew it was the right one and was very happy with how far I had come. 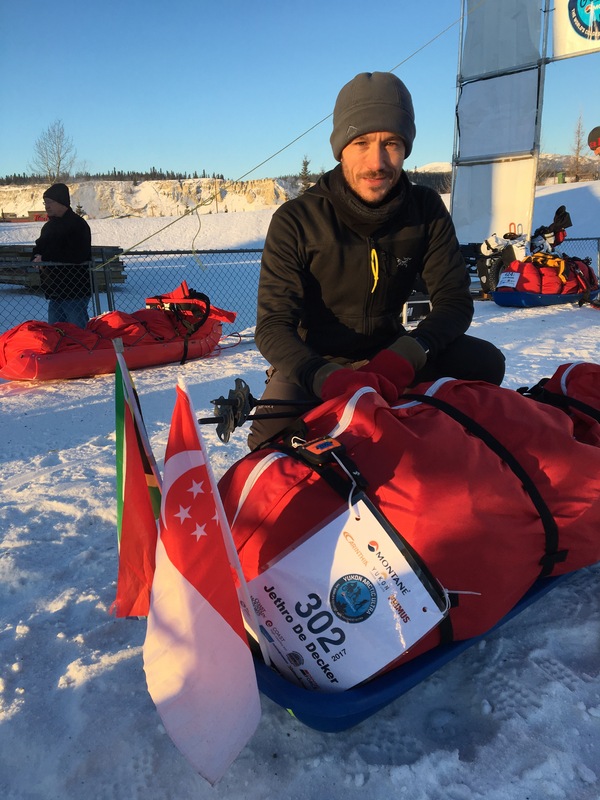 Leading the race meant that I had done everything else right – sleep & nutrition strategies, training, pacing and most importantly, adapting to the extreme cold. Just one tiny mistake with my shoes. 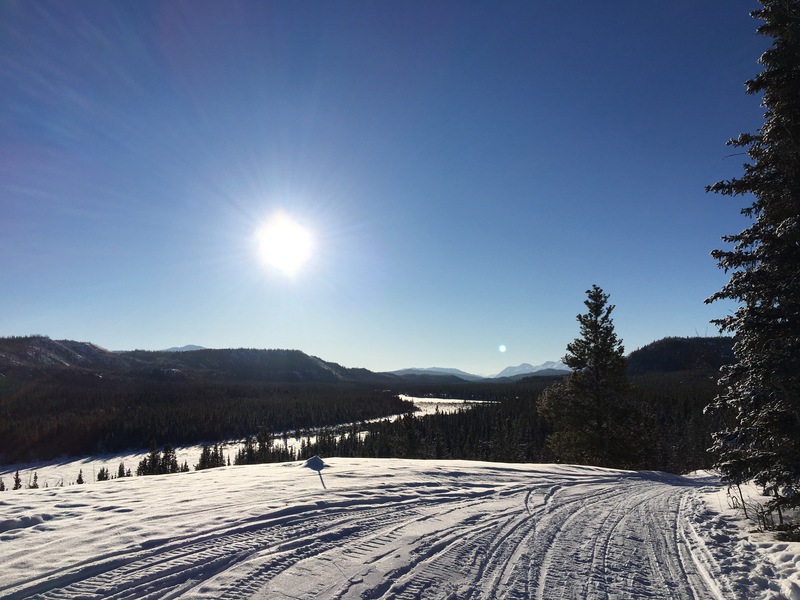 Experiencing the northern lights, remote parts of the Yukon and creating lasting friendships are all worth way more than getting to the finish line. And I will get to the finish line too, just not in 2017. Of the 13 on the start line of the 300 mile event, 4 got to the finish and all within 24 hours of the 8 day cut-off. The 430 mile race is still going, but with only a very dedicated few of the 43 starters remaining. The biggest cause of DNF seems to be frostbite; incorrect gear is also up there and one competitor stopped after a very close encounter with wolves, which had been following him for 2 days. However, in such an extreme environment, one of a thousand tiny mistakes can easily lead to a DNF – or worse. I do consider all of the ideas you have offered to your post. They are very convincing and can definitely work. Still, the posts are very brief for newbies. May just you please prolong them a bit from subsequent time? Thanks for the post. Thanks for every other fantastic article. The place else could anyone get that kind of information in such a perfect way of writing? I have a presentation subsequent week, and I’m at the look for such information. F*ckin’ amazing things here. I’m very glad to see your article. Thank you a lot and i’m looking forward to touch you. Will you please drop me a e-mail?